At WineTasting.com we are here to help you explore all things wine and help make you a taste-maker! Whether you are visiting Napa Valley or tasting at home with friends and family, we are here to help you appreciate the beautiful mingling of the senses that occurs when tasting wine. No disputing taste? No accounting for it? Observe the color and clarity of the wine. View wine by holding the glass up to a white background in a well-lit room. Use the rim of a tablecloth or even your white shirt’s sleeve. Notice if the wine is clear and brilliant or cloudy and dull. Notice the depth of color. Is it watery and pale or deep and dark? Looking straight down into the glass, can you see the bottom? Observe the rim. Is the color of wine same at the rim as in the middle? White wines vary from clear, through light green and all shades of yellow, to deep golden brown. They naturally darken as they age. Red wines range from red, ruby to purple, garnet and brick. As they age, they lose color and begin to brown. Ultimately, white wines begins to look more like reds and whites more like red wines with age. Also, observe the body of the wine by the way it coats the sides of the glass. If the “legs” trickle down slowly, it has more body. If it falls down in sheets, it has less body. Swirling wine in the glass exposes it to a larger surface area. This increases wine’s contact with air and intensifies its aromas. Swirl your wine by holding the glass by the base or by the stem. It is considered improper to hold the glass by the bowl itself as you can raise the temperature of the wine. 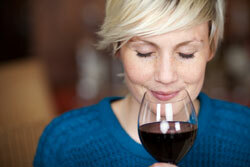 What is the very first characteristic you perceive when you smell wine? The smell of wine is referred to as its nose, bouquet or aroma. Common aromas include different fruits, spices, herbs and flowers. While different people will smell different things in the same wine, there are general smells specific to certain varieties. An aroma wheel is a great way to get acquainted with common aromas. Sherry: the wine has oxidized from age or improper storage. Vinegar: the wine contains excessive acetic acid. Cork/Mustiness: a defective or inferior cork has affected the wine. Sulphur: the wine contains excessive sulphur dioxide. Body Fullness or thinness: A function of both alcohol and glycerol. This can also be thought of as “weight” which is an often overlooked consideration when pairing wine with food. Wines with weight pair with heavier foods. Fruitiness: Intensity is dependent on the variety, growing conditions and wine making techniques. After swallowing, notice the aftertaste, or finish. The better the wine, the more defined the finish. Good finish will linger on your palate for quite some time and will reflect the flavors of the wine or have flavors on its own. What did you notice about the body? How long did the impression/flavor linger? Was it sweet? Acidic? Tannic? Fruity? Remember, there is no right or wrong answer! Like art, wine can be very subjective. The best way to learn what you like is to taste often and make notes. The temperature that a wine is served at can greatly affect the way it tastes and smells. 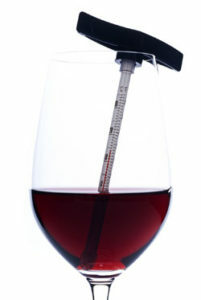 Lower temperatures will emphasize acidity and tannins while muting the aromatics. Higher temperatures will minimize acidity and tannins while increasing the aromatics. There are precise temperatures which are optimal for each wine type but generally whites should be served < 55 degrees and reds > 55 degrees. Ready To Take Wine Tasting to the Next Level? Just as we have biases in other aspects of life, a taster’s judgment can be prejudiced by knowing details of a wine, such as geographic origin, price, reputation, color, or other considerations. The power of expectations on perception must be managed in tasting as in life. People expect more expensive wine to have more desirable characteristics than less expensive wine. When given wine that they are falsely told is expensive they virtually always report it as tasting better than the very same wine when they are told that it is inexpensive. A wine’s quality assessment is more objective when performed alongside several other wines, in what are known as tasting “flights.” Generally, your “flight” should consist of three to five wines. If you are serving full-bodied reds like Cabernet Sauvignon or Merlot, open the bottles about an hour before you expect to sample the wine to let it breathe. One of the most famous instances of blind testing is known as the Judgment of Paris, a wine competition held in 1976 where French judges blind-tested wines from France and California. Against all expectations, California wines bested French wines according to the judges, a result which would have been unlikely in a non-blind contest. This event was depicted in the 2008 movie Bottle Shock and resulted in the Aged Cabernet Trust which ultimately led to the founding of Ambrosia and our library of aged California Wines. There are many different types of wine tasting parties you can conduct right in your own living room. 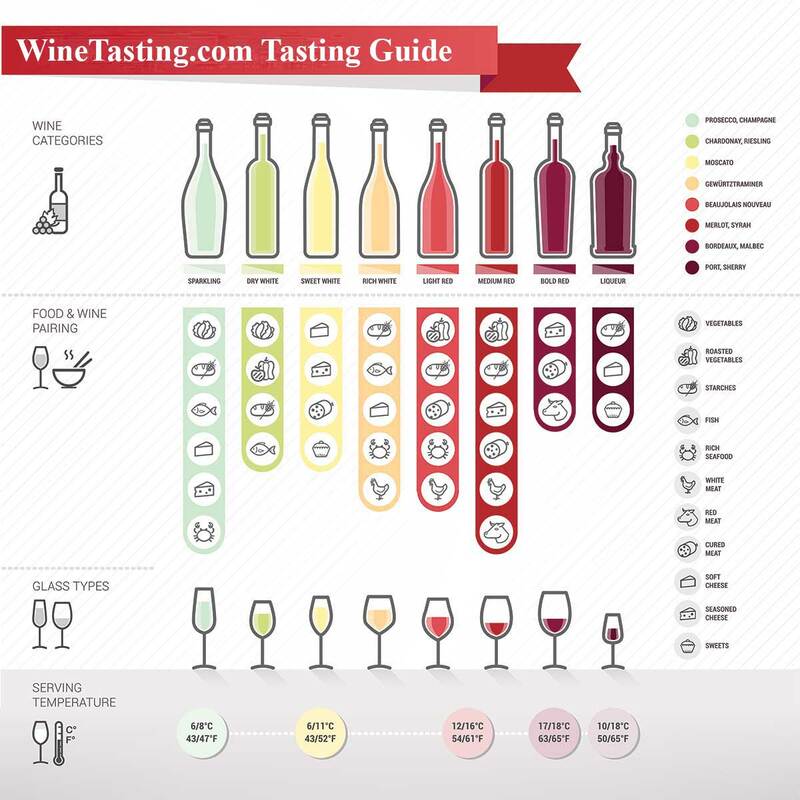 The main goals of any wine tasting are to learn more about the wine and where it came from, learn more about your own palate, compare notes with fellow wine lovers….explore, discover and have FUN! It’s in our name. At WineTasting.com we are here to help you make the best possible tasting experience. Whether you are visiting Napa Valley or tasting at home with friends and family, we are here to help you experience the beautiful mingling of the senses that occurs when tasting wine.